Train with Endurance Nation for a minimum of three months. Then if you start the race but don’t reach the finish line, for any reason, we will pay you CASH for your next attempt at the distance, up to a $500 value. Not knowing how to prepare correctly for a 140 mile triathlon while maintaining a balanced family and work life. Confusion about how to execute on race day. Trust us, 140 miles is too big of a problem to solve through fitness alone and a LOT can go wrong over that distance! Not feeling connected to a community of athletes. Ironman training, especially for your first, can often be a solo, lonely affair. Endurance Nation is here to help you, the first-time triathlete, reach the finish line you have been dreaming about. We will plug you into our Team Coaching System — quality training plans, resources, support from the Coaches and a community of 600+ experience athletes and 20-60 TeamEN members doing your race — that yields proven results. 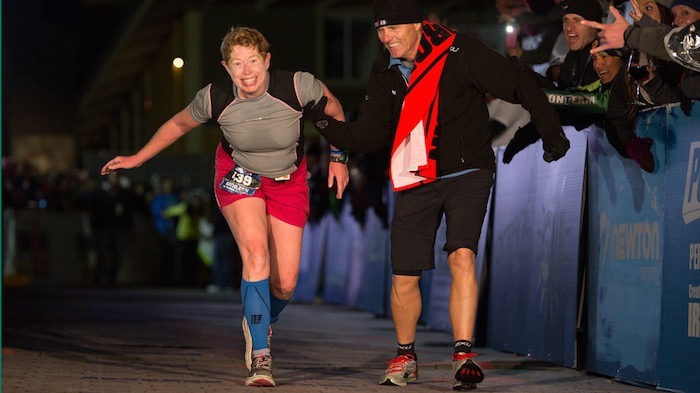 Endurance Nation has had over 1000 iron distance finishers per year since 2010. We are four-time Ironman® TriClub Division I World Champions, making us the largest and most active triathlon team in the world. If you start the race, but do not finish—for any reason—we will pay for your next long course triathlon entry, a $700 value. Sinee 2014, the first year of the Endurance Nation FirstTimeFinish™ Guarantee, more than 600 athletes participated and only three needed to use the guarantee. That’s a 99% success rate! More importantly, no other coaching organization in the triathlon space will guarantee your success and will pay you cash if they fail to bring you across your first Ironman finish line. That’s how strongly we believe in our training and racing system, and power of the Endurance Nation community to help you achieve your goals! Any Member of Team Endurance Nation who has never finished an iron distance event, consisting of a 2.4 mile swim, a 112 mile bike and a 26.2 mile run. How Do You Enroll In Endurance Nation’s FirstTimeFinish™ Guarantee? Become a Member of Team Endurance Nation (Click here to create a Free Trial), and you are automatically extended the FirstTimeFinish™ Guarantee, which includes agreeing to the Terms and Conditions of the program. How Does the FirstTimeFinish™ Guarantee Work? Commit to training at least three (3) months with Team Endurance Nation. Review the FirstTimeFinish™ training and racing resources. Crush your race! But if you don’t, we’ve got your back! Please Note: This is included and 100% FREE to all NEW, FIRST YEAR Endurance Nation members (returning members are not eligible for this benefit). You are within the calendar year of your EN membership. You have not claimed the FTF™benefit already. You started your race / event but were unable to finish. The event must be sanctioned by a governing body (USA Triathlon, USA Cycling, ETC.). In other words, training camps or similar trips are not covered. You are have signed up for a “do over” race and have a receipt (dated after your claimed FTF™race) we can use to reimburse you. Payment will be made out to you, upon request, via check. Payments are only for the registration fee; the FTF™doesn’t include travel or other race-related expenses. Eligible! You signed up for Endurance Nation in June 2020 and did not finish your race in Sept 2020. Ineligible! You signed up for Endurance Nation in June 2020 and did not finish your race in March 2021. Ineligible! You signed up for Plan*EN level and did not finish your race in your first calendar year (only Team*EN and Coach*EN athletes are eligible for this automatic benefit). Email Us to request your benefits after reading the details ^above^.